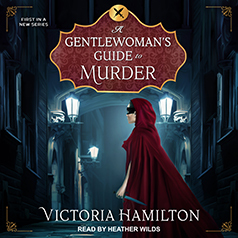 Victoria Hamilton presents Book 1 in the Gentlewoman's Guide to Murder series. Scandal and slayings among Regency London's elite. Did the man—or woman—who murdered the knight know of her visit? Her secret identity at risk, her reputation and life in jeopardy, Emmeline must solve the crime or face scandalous exposure and ruination, or worse—the hangman's noose—for a crime she did not commit.